I have several candy molds that I really do not use very often. 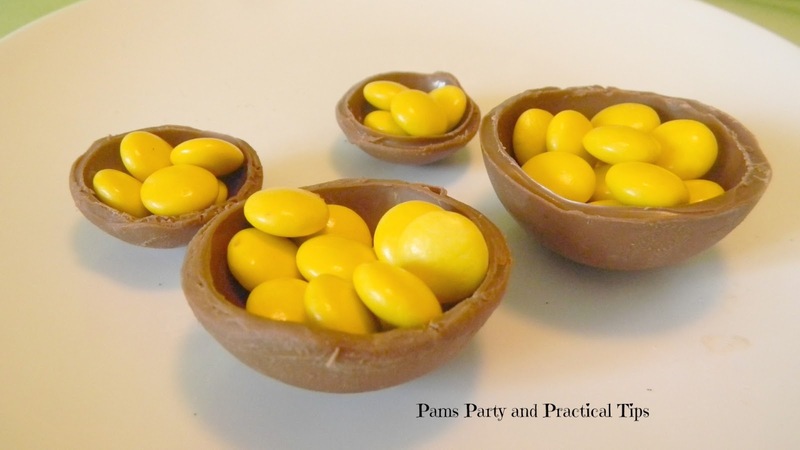 When I saw the chocolate bowl mold, it gave me an idea. The instructions said to fill each bowl about 1/3 full using a bag of melted chocolate. I normally use a sandwich baggie with the corner snipped off, but this time I used a Wilton pastry bag. I find it is much sturdier than the regular plastic bags. One the chocolate is added, I put the smaller mold on top, and slowly pushed it into the chocolate. Once the entire mold is filled, I put it in the refrigerator to chill. The instructions (which I somehow have misplaced) then said to put it in the freezer for a couple of minutes once the chocolate has a frosty look. The mold is ready. Time to remove the chocolate. this is what happened to the largest size bowls. Oh well it still tasted good. I was hoping the bowls would look more pot like, but they still did the job. I filled them with yellow Reeses Pieces. While they might look more like bird's nests than actual pots of gold, they are quite the yummy treat. It seems a few of the pots of gold have already disappeared.. Hmmmmm.. guess we have a few leprechauns in this house. 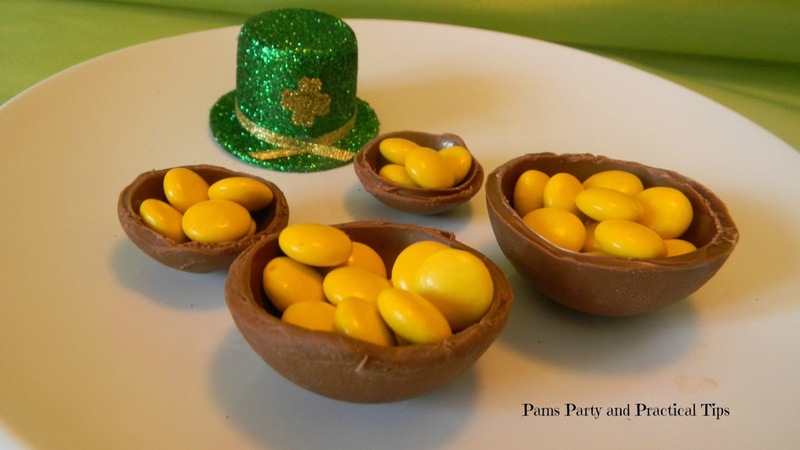 I will be linking up my Chocolate Pots of Gold to this awesome linky parties HERE. That's a great idea!! You could also put chocolate coins in them. I'm hosting a recipe link up party on my blog and would be thrilled if you decided to participate!!! Would be perfect for a wedding or baby shower. I love this idea! How cute, and I have that problem, chocolate in a mold breaks. Oh, how fun and cute!! Thank you for sharing at Sharing Saturday!